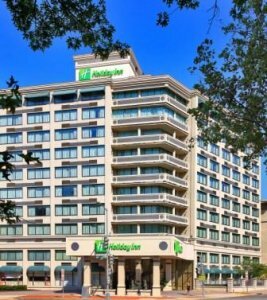 Holiday Inn Washington DC - Central/White House is renovated, with upgraded amenities. You'll find impeccable service at one of the most convenient locations in Washington, DC. Modern hospitality and our friendly staff are eagerly awaiting your visit. The hotel is walking distance to monuments, museums, and the business district. Major attractions are only minutes away. The Hotel is located at the north west corner of 15th street & Rhode Island Avenue, NW. Explore our site for more information about our excellent location and superior amenities.